Rafael Nadal returns to action next week in Davis Cup play. World No. 1 Rafael Nadal has declared that the dominance he and Roger Federer once shared at the Grand Slams is now a thing of the past. Furthermore, despite contributing nine trophies to their joint haul of 21 major titles since 2005 Roland Garros, the Spaniard insisted that it was Federer who was truly on top. 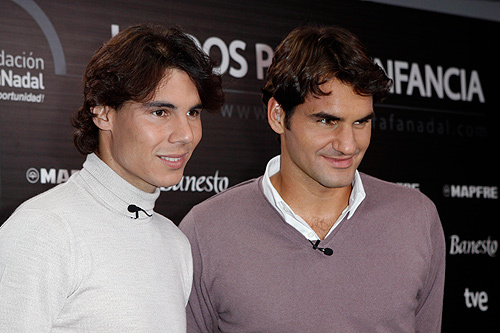 Speaking to Spanish media, the Mallorcan commented, In 2005, 2006 and 2007, perhaps you could say there was a bit of a monopoly, but it was down to Federer. I was also there, but a little less. For sure I think this monopoly ended some time ago. There are many players ready to challenge now. Before Federers Dubai runner-up points are calculated, Nadal has a healthy 4425 point lead at the top of the South African Airways 2011 ATP Rankings after compiling astonishing results in 2010, including winning Roland Garros, Wimbledon and the US Open. However, the left-hander scoffed at the suggestion that the rankings race was run between himself and his Swiss rival, not to mention the other challengers hot on their heels. Two years ago they said Federer was finished, and by the end of the year he had finished No. 1, having won two Grand Slam titles and played all four major finals, said Nadal. You have to have a little bit of patience and see how things are going to work out. By that, I dont mean that there wont be a change because the other two Djokovic and Murray are very good. And theres not just those two, theres others besides. Ive never seen so many new talents, he added. Of course there is [Milos] Raonic, the Canadian, who has started the year very well, and there is [Grigor] Dimitrov. They are the two youngsters who have improved the most. I cant say that Murray and Djokovic are youngsters who have broken through on the tour because theyve been No. 3 and 4 for three years now. And, at the end of the day, Im only a year older than them! After an enforced spell on the sidelines due to a left adductor tear suffered in his quarter-final exit at the Australian Open, Nadal is due back in action on Davis Cup duty for Spain against Belgium next weekend. Following that, the 24 year old will contest the first two ATP World Tour Masters 1000 tournaments of the season in Indian Wells and Miami. Although Nadal is a two-time former champion at the BNP Paribas Open, the Sony Ericsson Open continues to elude the Spaniard after runner-up finishes in 2005 (l. to Federer) and 2008 (l. to Davydenko). Its not something Im particularly focusing on, insisted Nadal. What matters to me is each day, each tournament. I havent won there [in Miami], but Ive been in the final twice and have also done well in Indian Wells. They are both as important as each other. They are the first Masters 1000s of the season and doing well there gives you a lift because they are the first tournaments that really count a lot after the Australian Open. Its a very important part of the season.